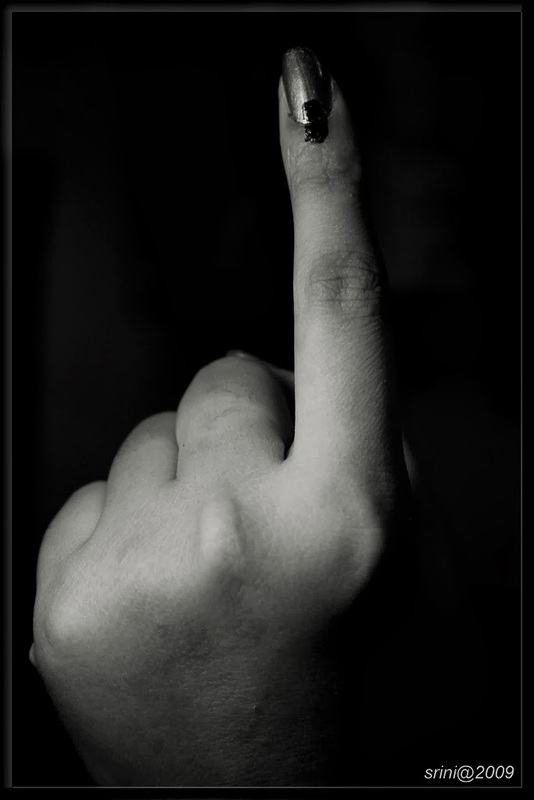 I wrote few posts about 2014 General Elections earlier this year - Elect, Elect and a bit on governance in Ordinance and Zero. This post is again on similar lines, however on importance of voting, especially for the youth. We are going to be 1billion working class in 2032, and the government elected for 2014-18 term will have a significant impact on employment prospects in 2032. One question is what would inspire and motivate a young Indian to go out and vote, especially in current political climate? We have an octogenarian heading the current administration for last ten years, and confidence of citizens in their honesty and ethical stature is at an all time low. There are innumerable instances of blatant corruption everywhere you look. I took this question from #VoteForIndia contest on Indiblogger. For me, voting is the key component of a Democracy, and an important avenue for self-expression. Huh! How can secret ballot be a method of self expression? The simple act of voting expresses the power of you as part of electorate, and the results speak for themselves. Elections where voting percentage was high, have mostly yielded best candidate as winner, simply because citizens cared enough to come out and exercise their right as well as fulfill their duty towards democracy. Same question again? Huh. Well answer is different this time. Apart from exercising one's right and duty, voting for me is also 'Cool'. Lazy bums don't vote, hypocrites don't vote, but 'Cool' people make it a point to go out and vote. As long as we keep this positive perspective towards voting, we don't need more reasons to go out and vote. OK. This repetition is going bit overboard, but have some patience. Vote to be unique. Wait a minute. Isn't that counter-intuitive. We know ~45%+ electorate votes, then how will voting makes you unique? The stats are stats. In the people I know, <5% vote. So in my circle of friends, family and colleagues, ~1 in 20 went out to vote. So voting for me also makes me unique and stand out. Then what is the last section about? Well, more than anything it's an individual's prerogative whether to vote or not, however if you convince two of your friends to get their names on the voting list (or verify existing entry in the list), and then go and vote in General Elections 2014, it will ensure that 'Best' candidate wins from your area. One major hurdle in voting, is absence of name in voting list, OR ignorance about your voting credentials. It is important to be prepared for elections, by verifying one's name in the voting lists. I am sure, before 2014 General Elections in May, you will be prepared for voting. However is that sufficient? No, you should also get on your phone, fire up that messenger and pester at least two friends / family members / colleagues to ensure that they are also prepared to vote in 2014. Don't stop pinging them unless they confirm they are in. "Did everyone registered themselves in voting list for you respective areas? If not please do so. General Elections in May 2014 are important. We owe it to ourselves for ensuring best candidate to win. Please ensure your preparedness to vote. " Karnataka voters, please register at this link, if you are not already registered.